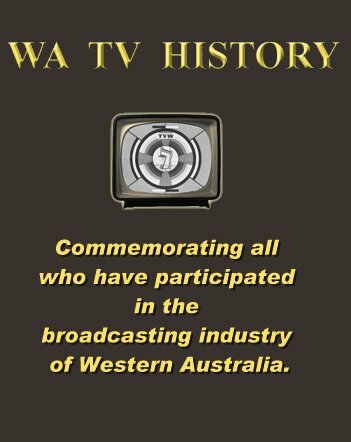 He then launched into prominence on Seven presenting the the popular school quiz program, “It’s Academic”, which ran for ten years from 1969 to 1979, and then revived in 2001 for another four years, once again with Jeff as Executive Producer and compere, until the show was taken east, where it is now presented by Simon Reeve. He also hosted and produced Perth’s New Faces, a series of Letterbox, Reach for the Stars and many national beauty pageant shows, and over the past four decades has been the face of TVW’s annual 24-hour fundraising event, earning him the title of “Mr. Being a still photograher gave Steve the opportunity to capture the on-air antics and publicity shorts of various personalities. … Dawn Lake’s most enduring character was Ethel, here shown reliving her popular Country Cousins sketch with Stuart standing in for the deadpan John Maras, as Ethel in her cardy and headscarf, urging her mute cousin Mary with her catchphrase, &quot;You tell ‘em, luv!